Google recently updated its Android platform to repair several major Wi-Fi network security vulnerabilities. The security patch was released in response to the discovery of hidden security issues in the Wi-Fi driver, making the phone vulnerable to hacking attacks, privilege escalation, and even the possibility of malware running software programs in the core memory of attacked mobile devices. This made it necessary to flash the operational systems of the affected smart phones and install software patches to repair the security gaps. Such recurring security issues increasingly make consumers worried that their smart phones could be hacked any moment, and their private or company data such as emails may be stolen. 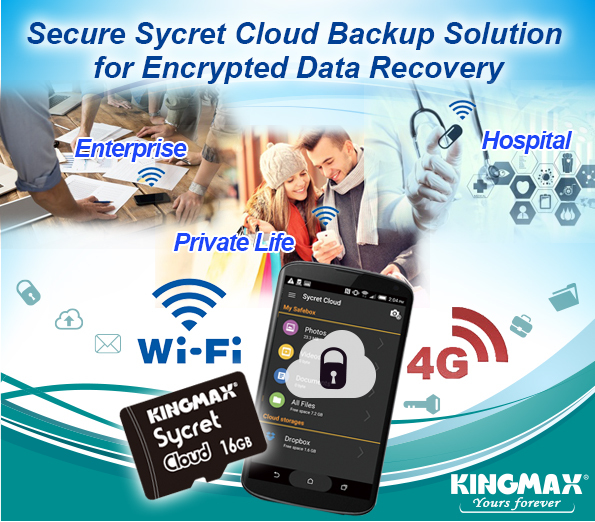 To make using the Internet of Things (IoT) and Internet of Beings (IoB) applications safer, KINGMAX launches Sycret Cloud, the world's most advanced innovative design for Smartphone encryption card and app, a portable device is easy to encrypt Smartphone data via Security IC packaging technology using encrypted multiple Sycret keys which enables perfectly safe to transfer files of simple plug and play for smart phones anytime anywhere. This unique real-time encrypted Cloud storage safeguards the security and convenience of mobile devices used by the general public, corporate Shadow IT, and mobile health and medical care, enabling secure transmission of personal and private information, trade secrets, confidential information, and medical records under the protection of multiple Sycret keys protection measures. This is also the most effective, high-speed, reliable solution for data recovery based on Secret keys. Users no longer need to worry that private images or videos will be exposed or valuable information is lost after their phone or card has been lost. The Sycret Cloud encryption card renders hackers powerless.